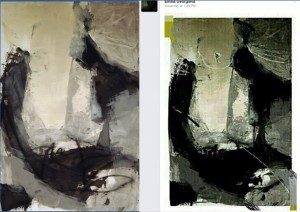 On the right is an ‘artist’ Emilia Georgieva’s piece that she has been posting on group art sites on Facebook. It stopped me in my tracks because it looked SO familiar! I layered the 2 pieces on top of each other in Photoshop and they match completely, so this is an obvious case of blatant uploading from the internet (its not even a good upload). How can someone take someone else’s work, add a couple of lines, and then call it their own? Am I crazy or is this not blatant stealing? I did confront her on the Facebook page that she had been posting it on and at first she ignored me. After a few other artists chimed in asking for an explanation….she showed up but only to deny it. I just hope that she is embarrassed enough by this that she wont do it to me or another artist again. As artists we need to look out for each other and back each other up when things like this happen! Last year I came across an ‘artist’ in Spain who was taking other peoples photographs and combining other peoples art and then selling the resulting images as his own. I immediately recognized a Canadian artists work in his image (he didn’t even hide it well!) & I contacted the artist to warn him. He was very surprised and got his lawyers involved immediately. I suppose this will happen more and more in the future as copyright infringement will be a challenge to posting work online. Good for you to ‘out’ this thief! It’s sad to see that many artists think you should ignore these incidents. This will not go away if we simply ignore it. The attitude seems to be that it’s too much trouble to do anything about. The culture has to change so copycat work is not explained away as artistic license. Unfortunately, the education is lacking so many don’t even understand what plagiarism is. And the universal attitude of entitlement adds to the assumption that everything is fair game and we artists who object are selfish. I feel pretty strongly about this after having a former student copy my workshop material for her class at a bead show. After many e-mails she still wouldn’t acknowledge that she had ripped me off.